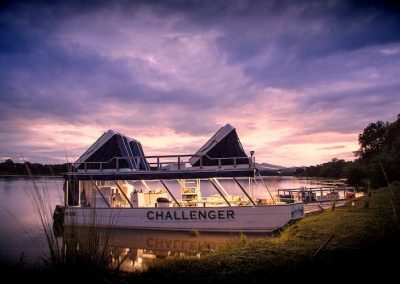 The Challenger is a custom built aluminium and fibreglass boat measuring 33ft long by 13ft wide. It is the largest of the fleet and is manned by 3 crew members which include a Skipper, Professional Guide and deckhand. 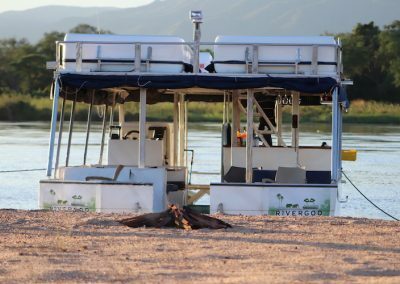 The vessel consists of two decks: A lower level for living and dining, and an upper deck with sleeping pods and a game viewing area. Maximum guest capacity is 8 passengers. The lower deck is carpeted with spacious and comfortable seating that doubles up as storage for guests personal effects and supplies for the trip. The kitchen area is equipped with a fridge, deep freezer and ice machine, allowing the food to stay fresh and beverages cooled and ready for enjoyment. All cooking equipment is self-sustaining and eco-friendly, running either on gas or solar power. The full gantry offers the chef all the tools needed to prepare a delicious spread or a delicate snack throughout the day. 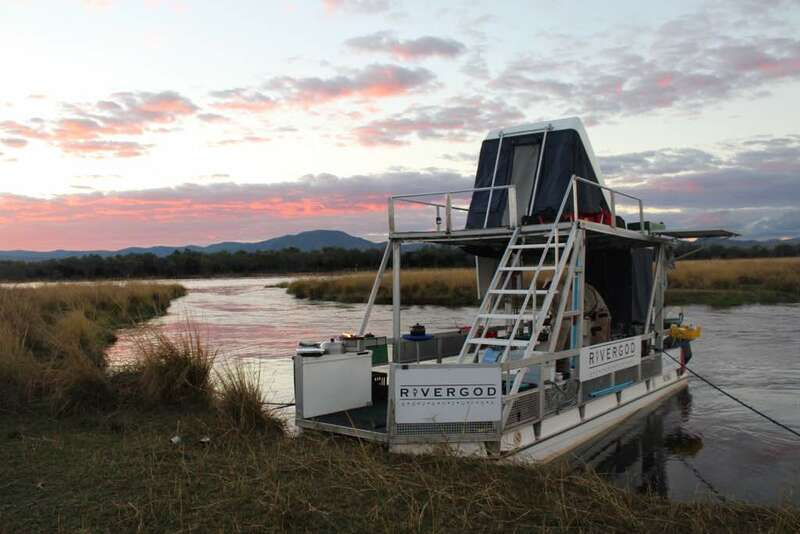 Outdoor hot water shower and bio flush toilet found on the main deck offer the guests some of the luxuries of modern living, all whilst maintaining a minimal footprint on the environment. 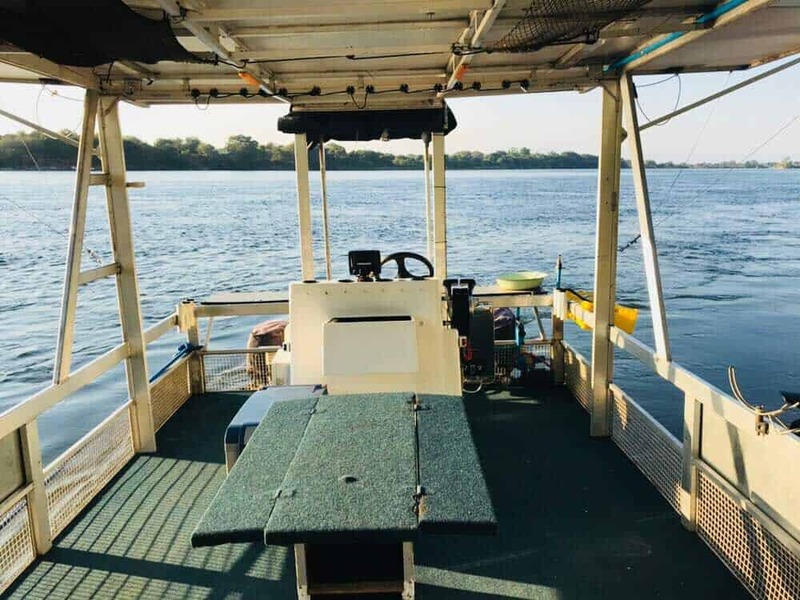 A semi-sun awning at the front of the boat offers guests the needed protection whilst still allowing them to enjoy their fishing and provide endless opportunities to capture memories on their preferred medium. On the upper deck, there are 4 custom built sleeping pods each containing a king size bed, 12V electric fans, solar power charging facilities for 12V and 240V accessories. Linen and towels are provided. 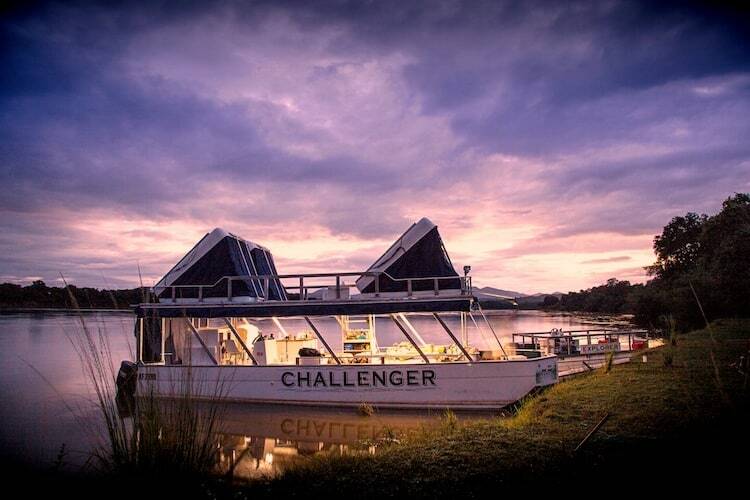 Between the pods, a large viewing platform / sunbathing deck is ideally positioned for the guests to capture the warm rays of the African sun as they lounge back and observe the river and its rich fauna and flora, or enjoy cocktails whilst taking in a beautiful sunset. 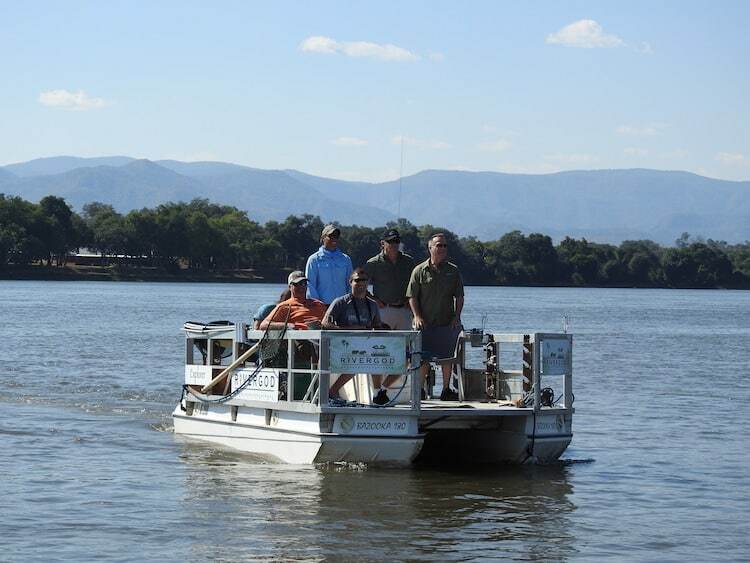 This platform is a great way to capture close up footage of the wildlife and birdlife along the banks of the Zambezi. 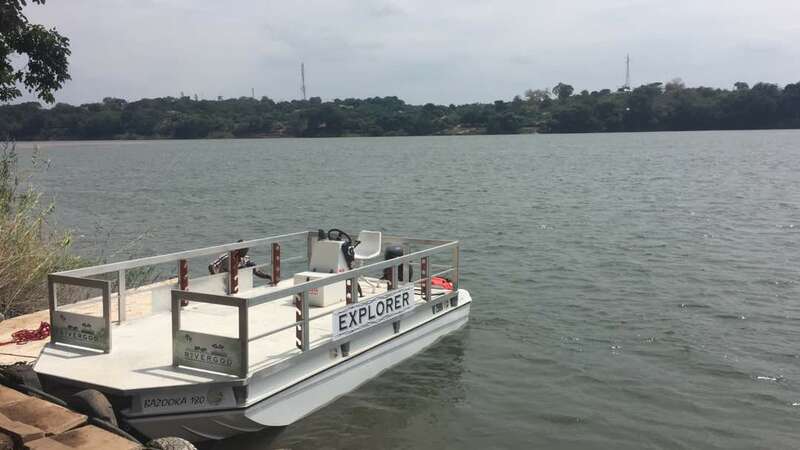 The Discovery was the first boat in the fleet and is a custom built aluminium and fibreglass design with two decks, measuring 23ft in length by 9ft in width. It caters for 2 guests and has a Skipper and Professional Guide as the crew to offer you anything you may need whilst on your adventure. The upper deck houses one custom built sleeping pot with a kingsize bed, electric fan, and solar-powered charging facilities. Linen and towels are provided. Solar-powered charging facilities for 12V and 240V are available on the main deck. A deep freezer, ice machine, dry storage, cutlery and crockery are provided for all meals. 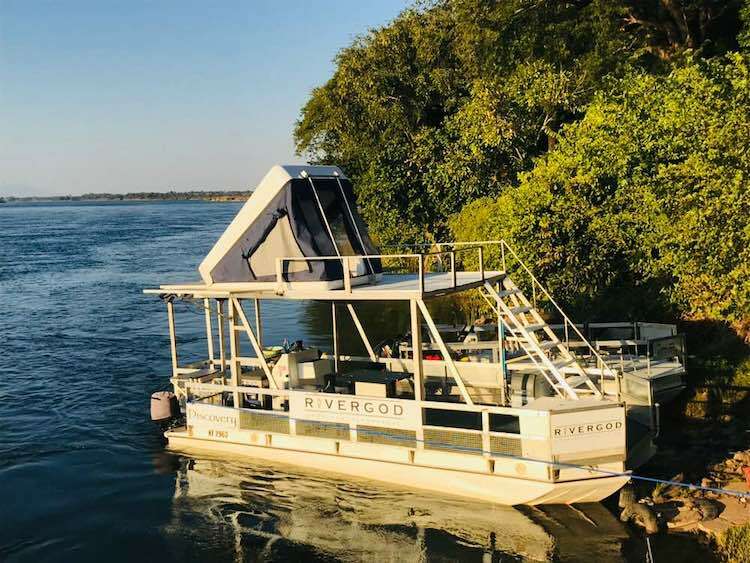 The hot water outdoor shower positioned on the Bermuda deck at the stern of the boat allows for 180 degrees of uninterrupted views of the vast Zambezi River. 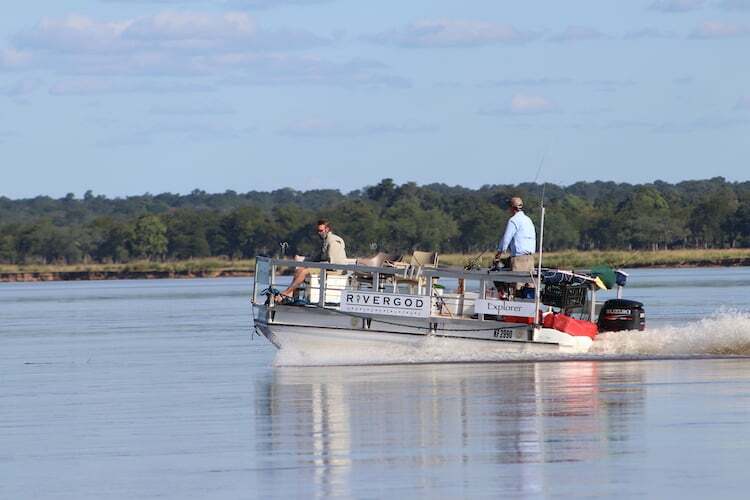 Fishing gear is provided for those who may want to try their hand at taming the mighty Zambezi Tiger Fish. Note there is no flush loo on this more rustic boat, but facilities are provided on land when the boat is moored every evening. 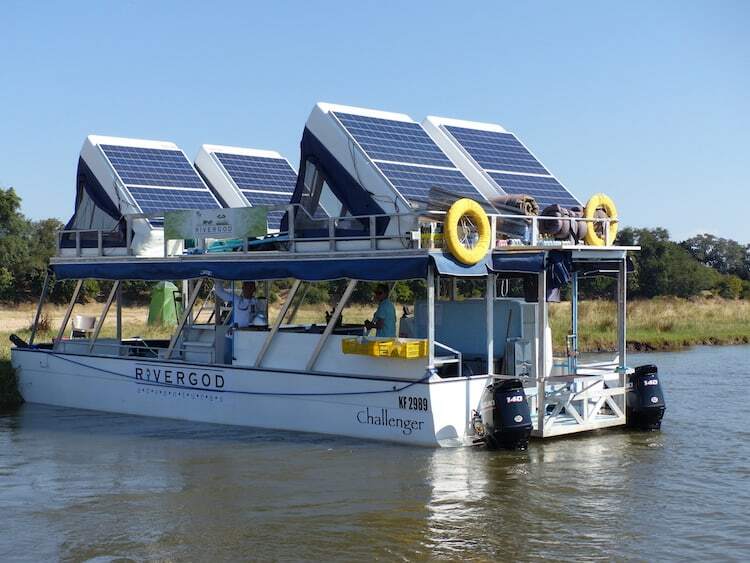 Explorer and Columbia are twin single level pontoon boats measuring 17ft in length by 9ft in breadth and manned by a Skipper. Safety rails, life rings and life vests are all on board the Explorer and Columbia. 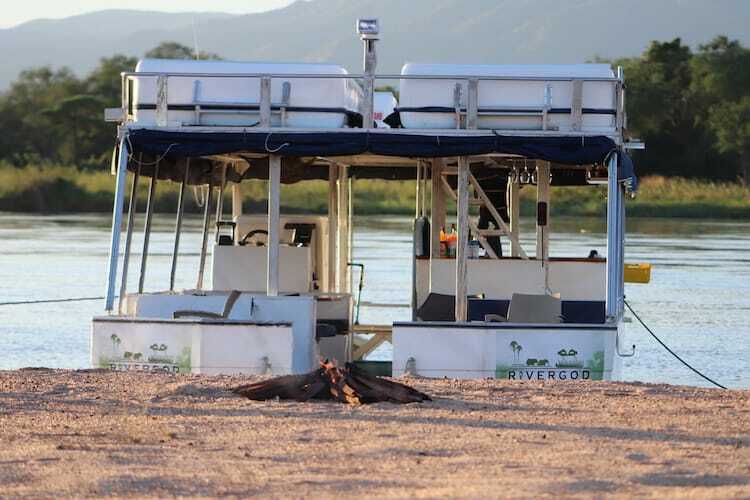 Their spacious walk-about deck takes 8 guests and is ideally suited for transfers to islands for walking safaris or for those who wish to fish in shallower waters. These tender boats accompany both Challenger and Discovery bookings. 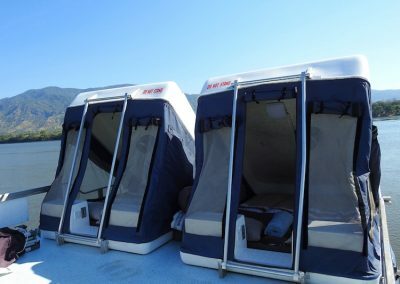 However, for guests that exceed 6 adults, we recommend adding a second tender to your booking to make activities a bit more comfortable for everyone.